I’m the kind of person who gets bored if I’m stuck in the same routine over and over again. I also get bored if I eat the same thing repeatedly. Breakfast is a meal where I love to experiment, but I also want to keep it healthy. I need something that sparks my tastebuds, but can also keep my belly full for a couple hours. This dish definitely satisfied both parts of my body; and was a refreshing change from the ordinary routine. This is called breakfast couscous, but it could easily be called afternoon snack couscous, or evening snack couscous. 🙂 When I saw this recipe I knew I’d like it; because I must admit, I ate this previous couscous recipe for breakfast more than once! 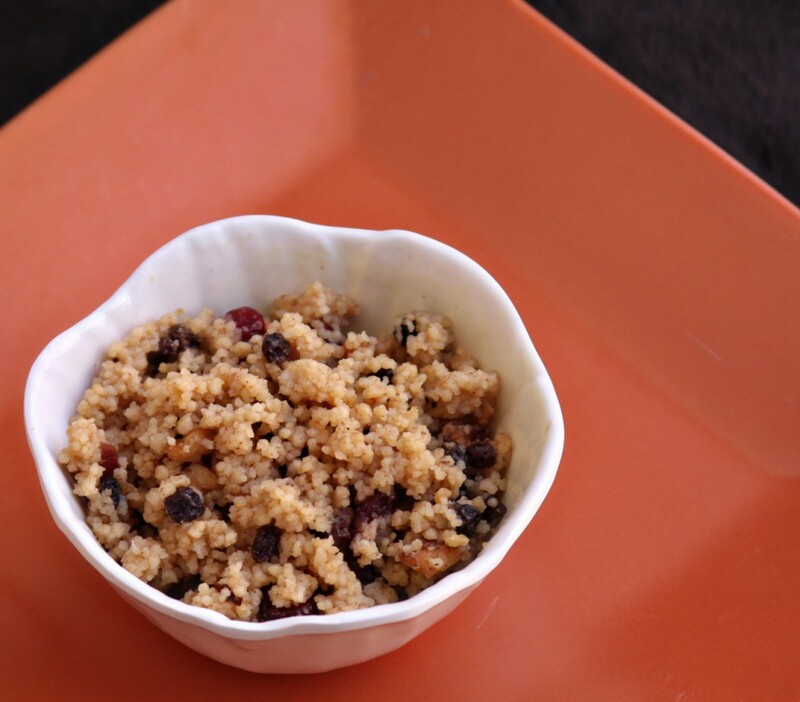 The flavor of this version had some sweetness from the brown sugar, raisins*, and dried cranberries. I also loved the nutty crunch provided by the walnuts; they paired well with the cinnamon. And, the addition of nonfat dry milk gives it a hint of creaminess that the other couscous recipe doesn’t have. I love that it was quick and easy to prepare, easy enough for a weekday! This recipe is a definite keeper, and has a place in my ever changing morning routine. *I used currants because I happened to have them on hand, so they are a little bit smaller than raisins. This sounds super healthy and very satisfying! 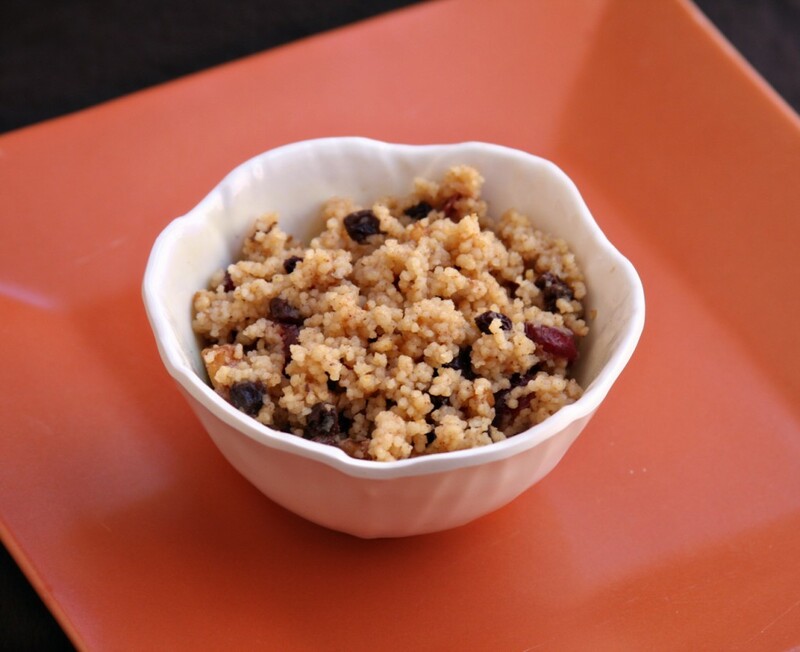 Never really thought of couscous as a breakfast food…but it sounds very tasty! YUM! I can’t wait to try this one! Yum! I’m getting a little tired of my oatmeal, so this might be a good alternative, especially since I have all the ingredients already. This looks fabulous Erin! YUM! Love this! Thanks for sharing. I substituted almonds for walnuts and doubled the dried cranberries instead of raisins. Thanks for posting this! I really struggle with knowing what to fix for breakfasts, so I’m always looking for recipes like this. I’ve only made couscous once and didn’t “supe” it up. Of course,afterwards I thought I didn’t like it. This is a great recipe to wet our toes (tongues, hee-hee) with.